Undocumented youth are taking to public and online spaces to represent themselves—in some cases, without the support of important allies. One by one, some twenty people—mostly youth—stood under a canopy of butterflies in front of the George Washington statue in New York’s Union Square yesterday, and came out as undocumented. Despite some rain, their allies in the crowd gathered for the fourth annual Coming Out of the Shadows event, a nationwide, month-long push to create a space for people to share their stories with one another. The event took place as undocumented youth have also taken to the internet this week, generating critical conversations about representation in the media, the arts and activism. On Tuesday, Angy Rivera, the person behind the first and only advice column for undocumented youth, AskAngy, countered artist Faviana Rodriguez’s popular “Migration is Beautiful” image. On her Tumblr, Rivera stated she wasn’t criticizing Rodriguez’s art in general, but that certain narratives “romanticize immigration,” and that there is nothing beautiful about the circumstances that undocumented people face daily. On Thursday, the Queer Undocumented Immigrant Project (QUIP), an arm of United We Dream, demanded an apology from the Human Rights Campaign (HRC). QUIP’s Jerssay Arredondo says he was invited by HRC to speak at the demonstration in front of the Supreme Court this week to repeal the Defense of Marriage Act—but that his speech was censured when he was told by HRC not to reveal his undocumented status. HRC did not respond to a request for an interview about the matter. Prerna Lal and Tania Unzueta published a piece in The Huffington Post on Thursday, responding to Frank Sharry’s recent essay in The Washington Post. Sharry, a longtime immigrant rights activist who founded America’s Voice, wrote that the immigrant movement was modeled after the mainstream LGBT movement. 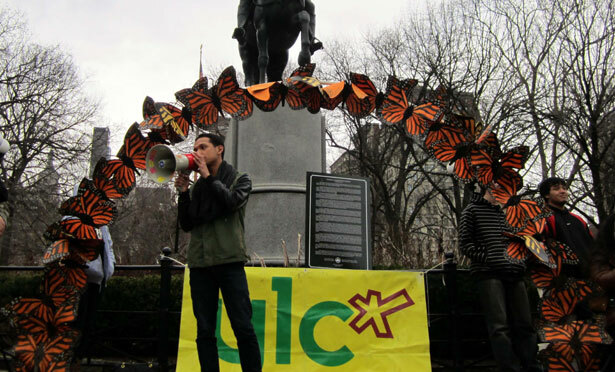 Lal and Unzueta, however, point out that Sharry’s essay “marginalizes the work and existence of queer immigrants.” The two provide a detailed outline of the ways in which queer undocumented youth have created spaces in which to come out of the shadows—even when their actions were rejected by mainstream activists and politicians. Undocumented people spoke one by one yesterday, and each story was unique. Some proudly grabbed the megaphone and spoke out about the liberation they felt identifying as undocumented. Others were more timid, fighting tears and nervousness through their stories of depression and suicidal thoughts, brought on by their undocumented status. All garnered the audience’s unwavering understanding and support. As the muggy sky began to darken on Union Square, 21-year-old Francisco Gutierrez took to the makeshift stage and shared his story. He explained his frustration and embarrassment upon learning he was undocumented when he realized he had no Social Security number with which to apply for a summer course while attended high school in Brooklyn. With the guidance of his school’s counselor, Gutierrez applied and was accepted at Georgetown, where he’s now a senior and continues to work around immigrant rights. Gutierrez explained that as difficult as it was for him to come out as undocumented some years ago, he also came out as gay to his parents last year. “It is in our collective stories that we can make a difference,” Gutierrez told the cheering crowd. Read Nan Hunter’s latest update on marriage equality at the Supreme Court.